It seems that Facebook is keen on making it's Messenger App as one stop for all your messaging needs and sharing files with out leaving from the Messenger app. 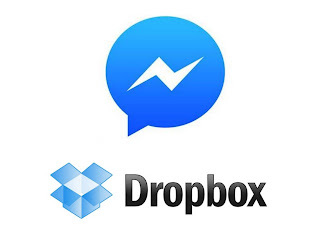 Messenger has included Drop Box (one of the cloud storage service) support to Android app and iOS app, by which you can directly share files (PowerPoint, PDF's etc.,), images and videos in your Facebook Messenger conversations. Previously, if you want share or send any content which is in Drop Box through Messenger App either first you need to download that content into your device and send the content or create a link to the content you want to share and send it in Messenger. This feature makes file, image and video sharing in Facebook Messenger App hassle free for the user. This feature in Messenger app can be accessed only if your device (i.e., Android or iOS) contains Drop Box App. Photos and videos you share will appear instantly in chat, while the files you share will have just link to them. Hit "More" button in Facebook Messenger conversation where you want to share. Then look for the "Drop Box" in the list of the apps in Messenger App. Select the file or image or video that you want to share in that conversation. It will take you to the confirmation screen with preview which has two options "Send" and "Cancel". Select "Send" option. That's it. File is successfully shared. In Future Facebook is going to release update to Messenger App with Video chat heads. If you have any doubts feel free to post comment. We will get back to you, if we are able to answer it.